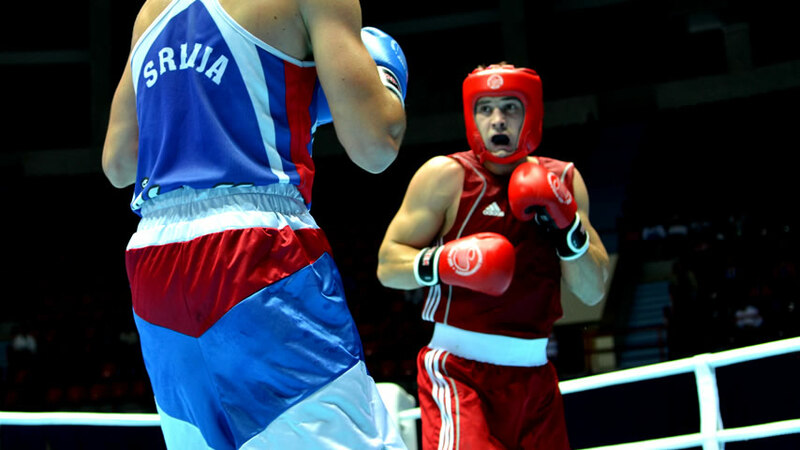 The current bronze medallist and Beijing Olympian Daugirdas Semiotas of Lithuania was another AIBA 'Road to Baku' boxer to advance to the next round of the AIBA World Championships. The Lithuanian star has been involved with his national squad since 2000 and he made his experience count as he beat Marko Nikolic 13:9, with the Serb having just returned from a long injury lay-off. Tajikistan's second AIBA 'Road to Baku' boxer also made a successful debut following his compatriot Safoviddin Yusufi's victory, with the 22-year-old Nurmagambetov Tournament silver medallist Dilovarskokh Abdurakhmanov giving a brilliant display against Bulgaria's inexperienced Stoymen Dimitrov. He needed only 159 seconds to stop his European rival. Ivory Coast's only representative at these Championships Davy Koffi Yoboue, member of the 'AIBA Road to Milan' program two years ago, had also been invited to compete in Baku but was completely outclassed by his opponent as Beijing Olympian Norbert Kalucza from Hungary claimed victory by way of R.S.C having lead this Bantam weight contest 17:5. Myanmar's last hope in Baku, National Champion Kyaw Kyaw Latt was stopped by USA's National Olympic Trials winner and WSB athlete Joseph Diaz in the second round when the referee ended the contest. This was a steep learning curve for the Burmese boxer who had no chance against the experienced American. Senegal's Zone2 African Championships bronze medallist Matar Sambou had a strong opponent in his opening contest in Baku as he was comprehensively beaten 3:12 by Belarus' Bocskai Memorial Tournament bronze medallist 20-year-old Dmitriy Zhukov. Dominica's newcomer Rowain Christopher was not given any time to showcase his skills in the ring as European Championships bronze medallist and WSB boxer Victor Cotiujanschii was ruthless in his execution as the Moldovan Middle Weight athlete advanced to the next stage of the competition after a first round R.S.C. Another Dominican boxer Lennon Bannis put in a brave performance in his attempt to beat a strong European boxer in Baku with the young pretender from the small Caribbean island up 2:1 against Bosnia & Herzegovina's Dzemal Bosnjak until his inexperience lead him to be disqualified in the second round as he failed to reach the Top32. Jamaica's UK based Central American and Caribbean Games bronze medallist Jovan Young was sent sprawling to the canvas within seconds of his bout and never recovered as he lost to the hard-hitting Ukrainian and three-time National Champion and Turkish Prime Ministry Tournament winner Oleksandr Gvozdik. Nicaragua's AIBA 'Road to Baku' member and Central American Championships silver medallist Osman Bravo did not last long in his contest against Ecuador's strongest fighter, Beijing Olympic Games quarter-finalist Carlos Gongora with the bout being stopped by the referee after two minutes as Gongora advanced to the next round.